This is another of those books that I have heard so many great things about around the blogsphere and I thought it was time to check it out for myself. On the positive: The story is interesting and held my attention throughout. Fallen angels are a popular theme at present, but this book came at it from a fresh perspective. Luce had some impact as a heroine - not a completely whiny teen for a change - and Daniel and Cam were nicely presented. At the end of the book, I was still keen to read on and find out what would happen to them next. On the negative: This book did scream 'Twilight with angels' at me a few times and many of the characters seemed to correspond too. Luce, while not whiny, is still somewhat stupid, which was annoying at times. The writing is by no means the worst I've read, but the prose style and dialogue are not amazing. So, a bit of a mixed bag for me, but overall I would say that I found it an enjoyable way to while away a couple of hours. I have actually just started Torment and I have Passion sitting on my bookshelf, so I will read on and finish the series to see where the story will go and what will happen to Luce and Daniel. I had this same reaction you did to this book. There was so much hype about it I was looking forward to it but was not all that impressed. Just an ok read for me. I'm with you on this being a mixed bag, but ultimately I enjoyed it. I really didn't like Tormert, and but loved Passion. So hope you enjoy the rest of the series! I read this a while back and thought the exact same thing! I don't think I'll bother with the sequels but I hope you enjoy them! Just stopped by to thank you for visiting my blog. 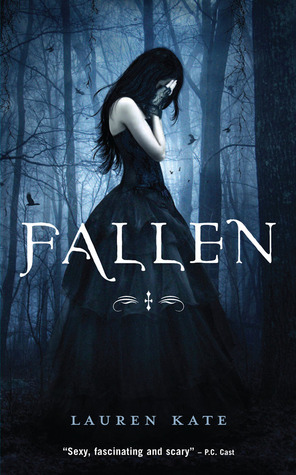 I am still on the fence whether to read Fallen or not. I just can't get excited about it and your review was honest...so I think it will shuffle further down in the pile.